PC Howard Ltd offers a pick and pack operation with the highest levels of customer service. 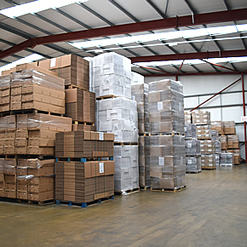 With continual investment in our well trained and dedicated workforce based at warehousing depots in Peterborough and Corby, we have all the necessary infrastructure in place to manage your product in bulk – in effect, the perfect fulfilment solution. We can take your product in large quantities, split your stock into individual consignments, re-package and send it to its destination. And as PC Howard Ltd is a member of the Palletways Network, we can also tap into this service too, whether in the UK or Europe. A dedicated, modern vehicle fleet which is serviced and maintained 'in-house'. This service is ideal for customers who store large quantities in bulk at one of our three dedicated warehousing facilities and forms an integral part of our 3PL solutions. The service is also integrated into our warehousing systems to ensure that accuracy is maintained. Consignments can be transported using PC Howard's own dedicated vehicle fleet or can be distributed via the Palletways network.